Tune InDecoding Humpbacks Premieres Sunday, July 6, at 7 PM e/p. The humpback whale is one of the most easily recognized whale species. Reaching between 40 and 50 feet in length, a humpback whale can weigh up to 48 tons. They are identified from other whales due to their large flippers, almost one-third of their body size, and the hump on their backs. Humpback whales are anywhere from a gray to black color and have white markings on their underside. Differing in every whale, these markings are like fingerprints, allowing researchers to identify individuals. Humpback whales live in oceans across the globe and can be seen in shallow water. Generally, these whales live and travel together in pods upwards of 20,000 whales. These whales are known for their complex mating songs. Researchers have studied the whale songs for years, and the complexity of these songs suggests the whales are extremely intelligent creatures. Only the males are responsible for the whale songs, however, since they are primarily a mating signal. Additionally, these whales are famous for the water acrobatics. Humpback whales can frequently be seen leaping out of the water and sometimes can use their flukes to propel themselves completely out of the ocean. 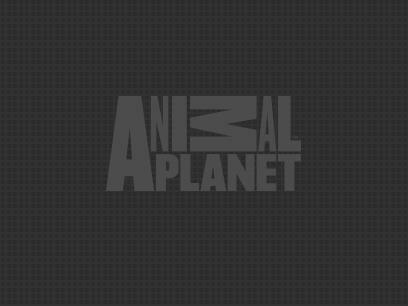 Humpback whales eat fish and krill. They are baleen whales, meaning they are filter feeders. These whales have two parallel rows of baleen plates attached to their jaws, allowing them to filter water for fish and krill. They can eat up to a ton of food a day, and newborn humpback calves can eat 100 pounds of their mother's milk a day. They only feed in the summer months. Humpback whales were first protected as endangered animals in 1966. 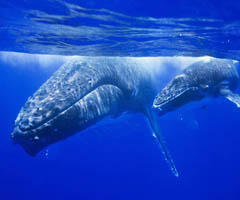 Currently, it is believed 30,000 to 40,000 humpback whales are left or about 30 percent of their original population. Humpback whales breathe voluntarily, unlike human beings. Since they have to remember to breathe, researchers believe humpback whales sleep by shutting off half of their brain at a time.